USS Louisiana, the last of the Ohio-class to be built, arrives at Naval Base Kitsap, Washington (2005). The Ohio class of nuclear-powered submarines is the sole class of ballistic missile submarines (SSBN) currently in service with the United States Navy. Fourteen of the eighteen boats are SSBNs, which, along with U.S. Air Force strategic bombers and intercontinental ballistic missiles, constitute the nuclear-deterrent triad of the U.S. The remaining four have been converted from their initial roles as SSBNs to cruise missile submarines (SSGNs). The Ohio-class boats, each displacing 18,750 tons submerged, are the third largest submarines in the world, behind the 48,000-ton Typhoon class and 24,000-ton Borei class of the Russian Navy. The Ohio class replaced the Benjamin Franklin- and Lafayette-class SSBNs. The lead submarine of this class is the USS Ohio. The 14 Trident II SSBNs together carry about half of U.S. active strategic thermonuclear warheads. Although the Trident missiles have no preset targets when the submarines go on patrol, they can be given targets quickly, from the United States Strategic Command based in Nebraska, using secure and constant radio communications links, including very low frequency systems. All the Ohio-class submarines, except for USS Henry M. Jackson, are named for U.S. states, which U.S. Navy tradition had previously reserved for battleships and cruisers. The Ohio-class boats are the largest submarines ever built for the U.S. Navy. Two Russian Navy classes have larger total displacements: the Soviet-designed Typhoon-class submarines have over twice the total displacement, and Russia's Borei-class submarines have roughly 25% greater displacement, but the Ohio-class boats carry more missiles than either: 24 Trident missiles apiece, versus 16 by the Borei class (20 by the Borei II) and 20 by the Typhoon class. The Ohio class submarine was designed for extended strategic deterrent patrols. Each submarine is assigned two complete crews, called the Blue crew and the Gold crew, each typically serving 70- to 90-day deterrent patrols. To decrease the time in port for crew turnover and replenishment, three large logistics hatches have been installed to provide large-diameter resupply and repair access. These hatches allow rapid transfer of supply pallets, equipment replacement modules, and machinery components, speeding up replenishment and maintenance of the submarines. Moreover, the "stealth" ability of the submarines was a quantum leap over all previous ballistic-missile subs. Ohio was virtually undetectable in her sea trials in 1982, giving the U.S. Navy extremely advanced flexibility. USS Michigan (SSBN-727) at a drydock in November 2002, before its conversion to an SSGN. The class's design allows the boat to operate for about 15 years between major overhauls. These submarines are reported to be as quiet at their cruising speed of 20 knots (37 km/h; 23 mph) or more than the previous Lafayette-class submarines at 6 knots (11 km/h; 6.9 mph), although exact information remains classified. Fire control for their Mark 48 torpedoes is carried out by Mark 118 Mod 2 system, while the Missile Fire Control system is a Mark 98. The Ohio-class submarines were constructed from sections of hull, with each four-deck section being 42 ft (13 m) in diameter. The sections were produced at the General Dynamics Electric Boat facility, Quonset Point, Rhode Island, and then assembled at its shipyard at Groton, Connecticut. The US Navy has a total of 18 Ohio-class submarines which consist of 14 ballistic missile submarines (SSBNs), and four cruise missile submarines (SSGNs). The SSBN submarines are also known as "Trident" submarines[according to whom? ], and provide the sea-based leg of the U.S. nuclear triad. Each SSBN submarine is armed with up to 24 Trident II submarine-launched ballistic missiles (SLBM). Each SSGN is capable of carrying 154 Tomahawk cruise missiles, plus a complement of Harpoon missiles to be fired through their torpedo tubes. As part of the New START treaty, four tubes on each SSBN will be deactivated, leaving each ship with only 20 available for warloads. The Ohio class was designed in the 1970s to carry the concurrently-designed Trident submarine-launched ballistic missile. The first eight Ohio-class submarines were armed at first with 24 Trident I C4 SLBMs. Beginning with the ninth Trident submarine, Tennessee, the remaining boats were equipped with the larger, three-stage Trident II D5 missile. The Trident I missile carries eight multiple independently targetable reentry vehicles, while the Trident II missile carries 12, in total delivering more destructive power than the Trident I missile and with greater accuracy. Starting with Alaska in 2000, the Navy began converting its remaining ballistic missile submarines armed with C4 missiles to carry D5 missiles. This task was completed in mid-2008. The first eight submarines had their home ports at Bangor, Washington, to replace the submarines carrying Polaris A3 missiles that were then being decommissioned. The remaining 10 submarines originally had their home ports at Kings Bay, Georgia, replacing the Poseidon and Trident Backfit submarines of the Atlantic Fleet. In 1994, the Nuclear Posture Review study determined that, of the 18 Ohio SSBNs the U.S. Navy would be operating in total, 14 would be sufficient for the strategic needs of the U.S. The decision was made to convert four Ohio-class boats into SSGNs capable of conducting conventional land attack and special operations. As a result, the four oldest boats of the class—Ohio, Michigan, Florida, and Georgia—progressively entered the conversion process in late 2002 and were returned to active service by 2008. The boats could thereafter carry 154 Tomahawk cruise missiles and 66 special operations personnel, among other capabilities and upgrades. The cost to refit the four boats was around US$1 billion (2008 dollars) per vessel. During the conversion of the first four submarines to SSGNs (see below), five of the submarines, Pennsylvania, Kentucky, Nebraska, Maine, and Louisiana, were transferred from Kings Bay to Bangor. Further transfers occur as the strategic weapons goals of the United States change. In 2011, Ohio-class submarines carried out 28 deterrent patrols. Each patrol lasts around 70 days. Four boats are on station ("hard alert") in designated patrol areas at any given time. From January to June 2014, Pennsylvania carried out a 140-day-long patrol, the longest to date. The conversion modified 22 of the 24 88-inch (2.2 m) diameter Trident missile tubes to contain large vertical launch systems, one configuration of which may be a cluster of seven Tomahawk cruise missiles. In this configuration, the number of cruise missiles carried could be a maximum of 154, the equivalent of what is typically deployed in a surface battle group. Other payload possibilities include new generations of supersonic and hypersonic cruise missiles, and Submarine Launched Intermediate Range Ballistic Missiles, unmanned aerial vehicles, the ADM-160 MALD, sensors for antisubmarine warfare or intelligence, surveillance, and reconnaissance missions, countermine warfare payloads such as the AN/BLQ-11 Long Term Mine Reconnaissance System, and the broaching universal buoyant launcher and stealthy affordable capsule system specialized payload canisters. The missile tubes also have room for stowage canisters that can extend the forward deployment time for special forces. The other two Trident tubes are converted to swimmer lockout chambers. For special operations, the Advanced SEAL Delivery System and the dry deck shelter can be mounted on the lockout chamber and the boat will be able to host up to 66 special-operations sailors or Marines, such as Navy SEALs, or USMC MARSOC teams. Improved communications equipment installed during the upgrade allows the SSGNs to serve as a forward-deployed, clandestine Small Combatant Joint Command Center. 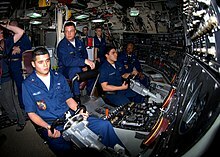 On 26 September 2002, the Navy awarded General Dynamics Electric Boat a US$442.9 million contract to begin the first phase of the SSGN submarine conversion program. Those funds covered only the initial phase of conversion for the first two boats on the schedule. Advanced procurement was funded at $355 million in fiscal year 2002, $825 million in the FY 2003 budget and, through the five-year defense budget plan, at $936 million in FY 2004, $505 million in FY 2005, and $170 million in FY 2006. Thus, the total cost to refit the four boats is just under $700 million per vessel. In November 2002, Ohio entered a drydock, beginning her 36-month refueling and missile-conversion overhaul. Electric Boat announced on 9 January 2006 that the conversion had been completed. The converted Ohio rejoined the fleet in February 2006, followed by Florida in April 2006. The converted Michigan was delivered in November 2006. The converted Ohio went to sea for the first time in October 2007. Georgia returned to the fleet in March 2008 at Kings Bay. These four SSGNs are expected to remain in service until about 2023–2026. At that point, their capabilities will be replaced with Virginia Payload Module-equipped Virginia-class submarines. Note: Boats based at Naval Base Kitsap, Washington are operated by the U.S. Pacific Fleet, while boats based at Naval Submarine Base Kings Bay, Georgia are operated by U.S. Fleet Forces Command, (formerly the U.S. Atlantic Fleet). The U.S. Department of Defense anticipates a continued need for a sea-based strategic nuclear force. The first of the current Ohio SSBNs is expected to be retired by 2029. So the replacement submarine must be seaworthy by that time. A replacement may cost over $4 billion per unit compared to Ohio's $2 billion. The U.S. Navy is exploring two options. The first is a variant of the Virginia-class nuclear-powered attack submarines. The second is a dedicated SSBN, either with a new hull or based on an overhaul of the current Ohio. As ballistic-missile submarines, the Ohio class has occasionally been portrayed in fiction books and films. Tom Clancy wrote Ohio class submarines into several novels, such as USS Maine (SSBN-741) in The Sum of All Fears (1991). The fictional USS Montana is featured in the 1989 film The Abyss. USS Alabama is the setting for the 1995 submarine film, Crimson Tide. The fictional ballistic missile submarine, USS Colorado (SSBN-753), is the primary setting for the ABC television series Last Resort. USS Wyoming is featured in Season 1, Episode 13 of American television series The Brave. ^ a b c d e f g h i j k l m n o "Ohio-class SSGN-726 Overview". Federation of American Scientists. Retrieved 2011-09-27. ^ "New U.S. Navy Nuclear Sub Class to Be Named for D.C." 28 July 2016. ^ a b c d e Frost, Peter. "Newport News contract awarded". Daily Press. Archived from the original on 26 April 2009. Retrieved 27 September 2011. (Subscription required (help)). ^ Adcock, Al. (1993). U.S. Ballistic Missile Submarines. Carrolltown, Texas: Squadron Signal. pp. 4, 40. ISBN 978-0-89747-293-7. ^ a b c d e f Adcock, Al (1993). U.S. Ballistic Missile Submarines. Carrolltown, Texas: Squadron Signal. p. 40. ISBN 978-0-89747-293-7. ^ a b c d e f g Adcock, Al (1993). U.S. Ballistic Missile Submarines. Carrolltown, Texas: Squadron Signal. p. 41. ISBN 978-0-89747-293-7. ^ Chinworth 2006, p. 2. ^ "941 Typhoon". Federation of American Scientists. Fas.org. 25 August 2000. Retrieved 27 January 2012. ^ "935 Borei". Federation of American Scientists. Fas.org. 13 July 2000. Retrieved 27 January 2012. ^ Chant 2005, p. 33. ^ Genat & Genat 1997, p. 39. ^ D. Douglas Dalgleish and Larry Schweikart, Trident. Carbondale, Illinois: Southern Illinois University Press. 1984. ^ Hans M. Kristensen (13 January 2018). "New Data Shows Detail About Final Phase of US New START Treaty Reductions". fas.org. Retrieved 3 February 2019. ^ a b "Guided Missile Submarines – SSGN". U.S. Navy. Navy.mil. 10 November 2011. Retrieved 27 January 2012. ^ O'Rourke, Ronald (22 May 2008). "Navy Trident Submarine Conversion (SSGN) Program: Background and Issues for Congress" (PDF). Congressional Research Service. Retrieved 7 February 2012 – via Fas.org. ^ Kristensen, Hans M. (December 2012). "Trimming Nuclear Excess: Options for Further Reductions of U.S. and Russian Nuclear Forces Special Report No 5" (pdf). Federation of American Scientists. ^ Arendes, Ahron (30 June 2014). "USS Pennsylvania Sets Patrol Record". Military.com. ^ "Submarine Launched Intermediate Range Ballistic Missile". Global Security. Retrieved 2011-09-27. ^ "USS Ohio Returns To Service As Navy's First SSGN" (PDF). Electric Boat News (Newsletter). General Dynamics Electric Boat. February 2006. Archived from the original (pdf) on 2009-07-31. ^ O'Rourke, Ronald (1 March 2012). "CRS-RL32418 Navy Virginia (SSN-774) Class Attack Submarine Procurement: Background and Issues for Congress". Open CRS. Congressional Research Service. Archived from the original on 17 December 2012. Retrieved 2012-11-21. ^ "USS Ohio (SSGN 726)". Naval Vessel Register. Navy.mil. 27 October 2011. Retrieved 27 January 2012. ^ "USS Michigan (SSGN 727)". Naval Vessel Register. Navy.mil. 24 February 2006. Retrieved 27 January 2012. ^ "USS Florida (SSGN 728)". Naval Vessel Register. Navy.mil. 13 September 2011. Retrieved 27 January 2012. ^ "USS Georgia (SSGN 729)". Naval Vessel Register. Navy.mil. 17 December 2007. Retrieved 27 January 2012. ^ "USS Henry M. Jackson (SSBN 730)". Naval Vessel Register. Navy.mil. 27 October 2011. Retrieved 27 January 2012. ^ "USS Alabama (SSBN 731)". Naval Vessel Register. Navy.mil. 27 October 2011. Retrieved 27 January 2012. ^ "USS Alaska (SSBN 732)". Naval Vessel Register. Navy.mil. 27 October 2011. Retrieved 27 January 2012. ^ "USS Nevada (SSBN 733)". Naval Vessel Register. Navy.mil. 27 October 2011. Retrieved 27 January 2012. ^ "USS Tennessee (SSBN 734)". Naval Vessel Register. Navy.mil. 23 August 2011. Retrieved 27 January 2012. ^ "USS Pennsylvania (SSBN 735)". Naval Vessel Register. Navy.mil. 27 October 2011. Retrieved 27 January 2012. ^ "USS West Virginia (SSBN 736)". Naval Vessel Register. Navy.mil. 22 August 2011. Retrieved 27 January 2012. ^ "USS Kentucky (SSBN 737)". Naval Vessel Register. Navy.mil. 27 October 2011. Retrieved 27 January 2012. ^ "USS Maryland (SSBN 738)". Naval Vessel Register. Navy.mil. 27 October 2011. Retrieved 27 January 2012. ^ "USS Nebraska (SSBN 739)". Naval Vessel Register. Navy.mil. 27 October 2011. Retrieved 27 January 2012. ^ "USS Rhode Island (SSBN 740)". Naval Vessel Register. Navy.mil. 27 October 2011. Retrieved 27 January 2012. ^ "USS Maine (SSBN 741)". Naval Vessel Register. Navy.mil. 23 August 2011. Retrieved 27 January 2012. ^ "USS Wyoming (SSBN 742)". Naval Vessel Register. Navy.mil. 23 August 2011. Retrieved 27 January 2012. ^ "USS Louisiana (SSBN 743)". Naval Vessel Register. Navy.mil. 26 July 2011. Retrieved 27 January 2012. ^ a b c d "SSBN-X Future Follow-on Submarine". Global Security. Retrieved 2011-09-27. ^ Terdoslavich, William (2006). The Jack Ryan Agenda: Policy and Politics in the Novels of Tom Clancy: An Unauthorized Analysis. Forge Books. p. 95. ISBN 0765312484. ^ Akers, Greg. "More patriot games played in Jack Ryan". Memphis Flyer. Retrieved 2019-01-25. ^ "Crimson Tide". Internet Movie Database. Retrieved 2011-09-27. ^ "Last Resort Co-Creator Explains Submarine Story Development". The Dead Bolt. 27 September 2012. Archived from the original on 1 October 2013. Retrieved 2011-09-27. ^ Roots, Kimberly (January 29, 2018). "The Brave Finale Recap: Man Down!". TVLine. Retrieved 2018-02-14. Chant, Chris (2005). Submarine Warfare Today. Leicester, United Kingdom: Silverdale Books. ISBN 1-84509-158-2. OCLC 156749009. Chinworth, William C. (15 March 2006). The Future of the Ohio Class Submarine (PDF) (Master of Strategic Studies thesis). Carlisle Barracks, Pennsylvania: U.S. Army War College. OCLC 70852911. Genat, Robert; Genat, Robin (1997). Modern U.S. Navy Submarines. Osceola, Wisconsin: Motorbooks International. ISBN 0-7603-0276-6. OCLC 36713050. Dalgleish, D. Douglas; Schweikart, Larry (1984). Trident. Carbondale, IL: Southern Illinois University Press. O'Rourke, Ronald. "Navy Columbia (SSBN-826) Class Ballistic Missile Submarine Program: Background and Issues for Congress". Congressional Research Service – via Every CRS Report. Wikimedia Commons has media related to Ohio class submarines.